other fine body care products. Qualified resellers, please contact Lancaster County Soapworks to request a wholesale code or enter code at checkout. Little luxuries to make one feel special no matter what the economy is doing. 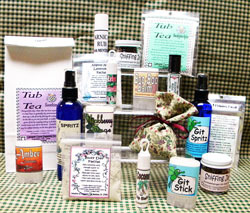 Spritzes and Lotion bars to match many of our soaps along with other all-natural products for self care. One of our most popular items. An 1.25 ounce glass jar filled with a combination of herbs and oils. herbs said to help balance those hormonal surges. 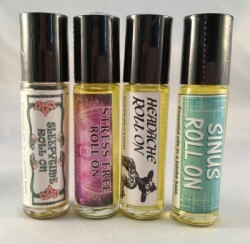 In addition to spritzes scented to match our soaps we also make Sinus to use as a pillow spray and our Git Spritz contains catnip essential oil which has been found to be as effective as deet. 4 oz. sprays in cobalt blue spray bottles. Base contains: Distilled water, CD alcohol, Polysorbate 20 and essential and/or fragrance oils. Wonderful clarifying clay based scrubs and masks for any busy woman. The lavender mask is perfect for evening cleansing. Just mix with water. Each packet contains enough for 2-3 facials. 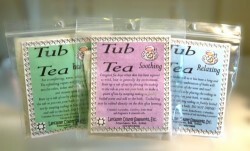 in fragrances to match some of our soaps. Also our Git Stick! and BooBoo Balm. perfect size to slip in a purse or pocket. Essential oil blends in a jojoba carrier oil. of essential oils said to combat cold sores. jojoba and vitamin E oils. sealed in a zip loc bag with colorful label. Calendula Petals, Yarrow Flowers, & Lavender Essential Oil. 5 stars in the herbal world that may help with various skin conditions. Calendula, Chickweed, Comfrey, Jewelweed and Plantain are infused in an olive oil and beeswax base. Lavender essential oil is also added. All content is ©2017 Lancaster County Soapworks.